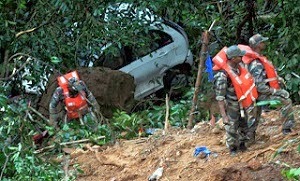 The Kerala state government is chewing over a Comprehensive Insurance Policy, for calamity-affected people in the state. It's a first of its kind initiative in the country. A detailed proposal for the scheme has been submitted by the Institute of Land and Disaster Management (ILDM). “At present there is no policy that considers all aspects and all types of disasters", Head of ILDM, Mr. K.G. Thara said, adding, “Sea erosion and lightning are not considered disasters in the national government's list, whereas in Kerala, a large number of deaths occur due to these." As per the proposal submitted the ILDM, the policy will be index-based for crop loss and health impacts such as sunstroke in climate-related disasters. It will also be indemnity-based (on actual loss basis) for climate-related as well as disasters such as tsunami, air, water and land accidents and building collapse. Insurance cover will also be given to utensils, household goods and educational equipment damaged in disasters. Utensils of self-help groups will also be covered. The government will fully pay the premium for below poverty line (BPL) families; while, for above poverty line (APL) families, ratio of ownership will have to be decided through consultative discussions. As per the proposal, there will four premium schemes with premium amounts of Rs.10, Rs.22, Rs. 25 and Rs.37 for the entire family. As per scheme 1, an amount of Rs.2 lac will be given for accident death or permanent total disablement of the breadwinner of a household, Rs. 1 lac in case of the spouse and Rs. 50,000 each for dependent children. In scheme 2, the amounts are Rs. 5 lac, Rs. 2.5 lac and Rs. 1 lac respectively. Scheme 3 and 4 has the extra provision of Rs.75,000 in case of damage to buildings and Rs.25,000 for damage to contents.